06-Dec-2013 -- This confluence visit is the first out of 2 visits that I made during a quite crazy cycling week-end in the Alpine mountains. Cycling in December in central Europe? This doesn’t sound very comfortable due to the low temperatures and short daylight times. But I had itchy legs again. This weekend seemed perfect: The forecast was sunny and not too cold at the Mediterranean coast. So on Thursday after work I flew to Nice with my boxed bicycle and stayed the night near the airport. On confluence day, I started cycling from the coast near Nice towards the confluence point in ca. 60 km distance. In Nice the temperature was 10-12°C. But what I hadn’t thought of was the big temperature drop when going inland. Two hours of cycling and I was in a white and frozen landscape. Secondly, I didn’t get much of the sun, because the canyons that I followed were too deep and steep such that the winter sun would never make it down into the valley. The last 8 km from Pont de Cians are really impressive, when cycling through the Gorges de Cians. At a distance of 800 m I left the road and parked my bicycle at a small swinging foot-bridge. This bridge has been mentioned by previous visitors – but since then this bridge has been degrading a lot. There are holes and rotten boards in the bridge. Nevertheless, I made it cautiously over the bridge. On the other side, a huge private rubbish dump greeted me (it has been also mentioned by previous visitors; the situation must have become worse however). As I understood from previous visitors, the confluence is on a very steep and inaccessible rock face. So instead of trying to get to the confluence not from the valley side, I opted for an approach from the mountain ridge. This meant a lot of climbing and bush-walking. After an hour, I got exactly to the confluence and was even able carry out the confluence dance to obtain all zeroes. However, the accuracy shown at the GPS device was only 14 m. The confluence is half way up the mountain and has a beautiful valley view. It was actually hot in the afternoon sun – nice t-shirt weather, while in the valley the white frost stayed all day. I was curious whether I would be able to directly climb down to the point where all other visitors had been halted. Indeed there is a huge blank rock face. But I was able to climb around it. Interestingly, I reached a footpath at 80 m from the confluence point! So this is actually a confluence for the whole family. I stayed the night 30 km further west in the town Annot together with a very nice and generous family. 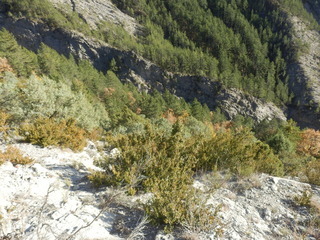 Vegetation: small pine trees, bushes. The story continues is at 44°N 6°E.